So there is no denying that Easter is coming up. I totally haven’t been in the groove of punching out holiday content this last year. I mean it’s completely weird. I totally went all pumpkin for Thanksgiving, but not too much for the holiday’s following. I mean I didn’t even do anything for Valentines Day! What is wrong with me! So I figured, since I still had a little time before Easter, and I did buy all this cool Spring themed decorations and baking stuff that maybe, just maybe I would get something Easter/Spring themed in before it past me by and I ran out of opportunity! 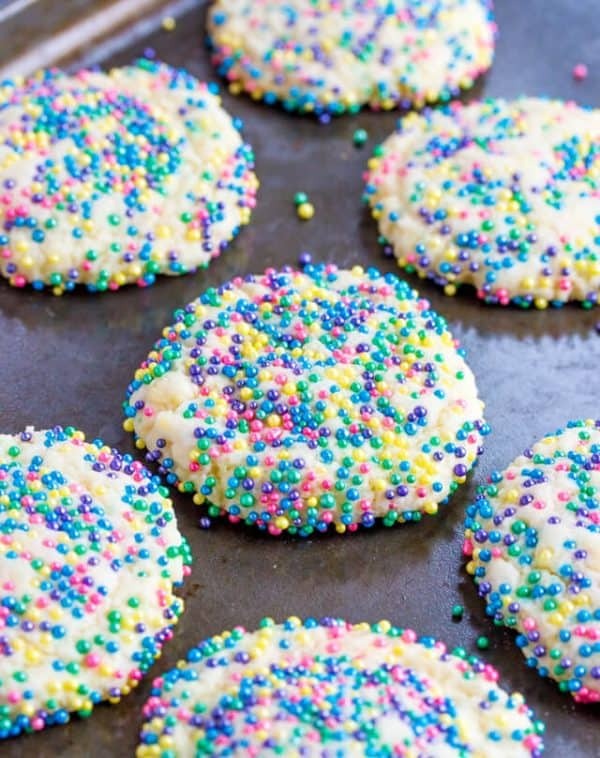 Well my friends these Easy Sprinkles Cookies (yes, the name is short and sweet and to the point) are exactly what the name implies. 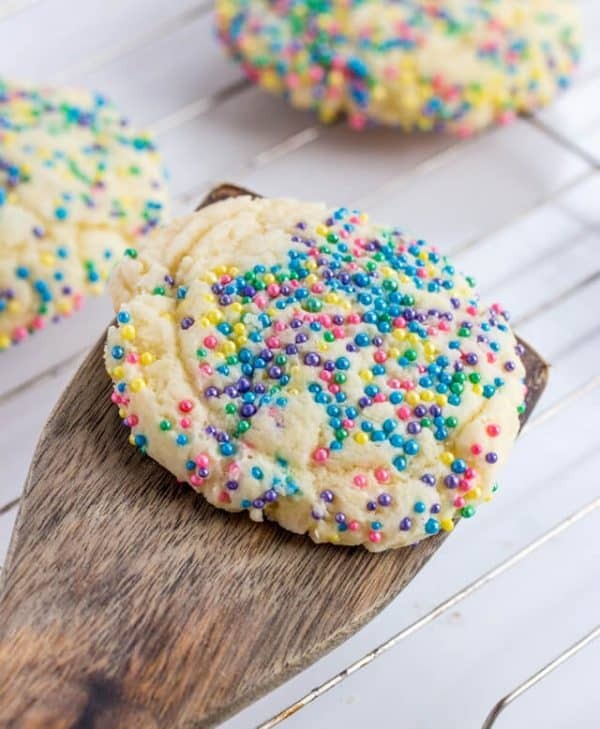 They are super easy, they use 4 ingredients, and super quick. They bake in less than 10 minutes. And oh boy are they tasty. So you know Mr. Non Sweets Lover right? Yeah, well he literally ate half my batch. It was crazy, I guess I have to make simple recipes for this guy to want to put it in his mouth. He literally hates all things sweets, minus gummy worms and the like. Whereas I am the complete opposite. I would eat cake, pie and cookies for every single meal if I could. Which I totally could, but I know that it would be absolutely bad for me, so it weighs on my conscience when I seriously think about doing it, and my friends…it happens a little more often then this girl would care to admit. So usually I’m the homemade type of girl, I just am…I think there is something fun with starting every recipe with from scratch ingredients. But sometimes a girl just wants and needs to use a cake mix. There is absolutely no shame in that. 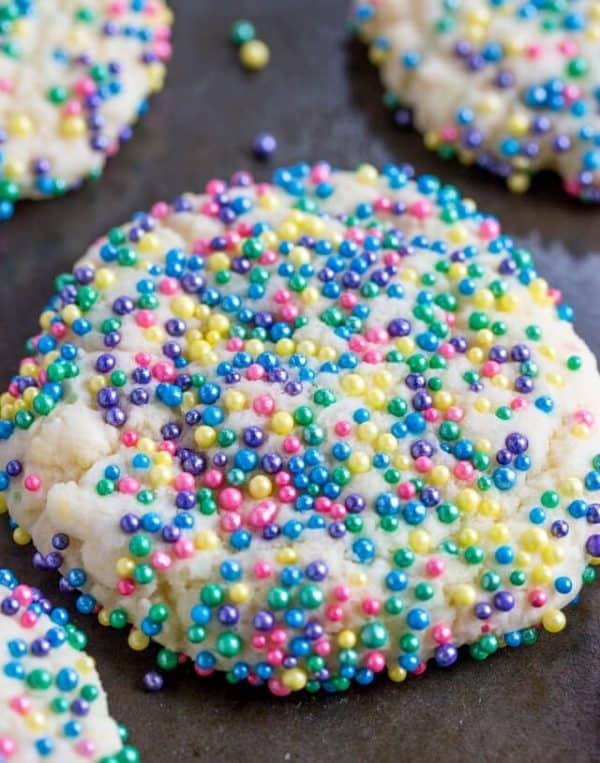 There once was a time where this girl hated sweets and baking and when I DID actually bake something for say my kids, that it usually was a boxed cake mix, canned frosting or some store bought cookies!! But when I got a little more domestic I branched out and realized how much I loved to bake. It was relaxing and quickly became an addiction. So my kids and husband are real big cookie lovers, you still have to convince me to love cookies. 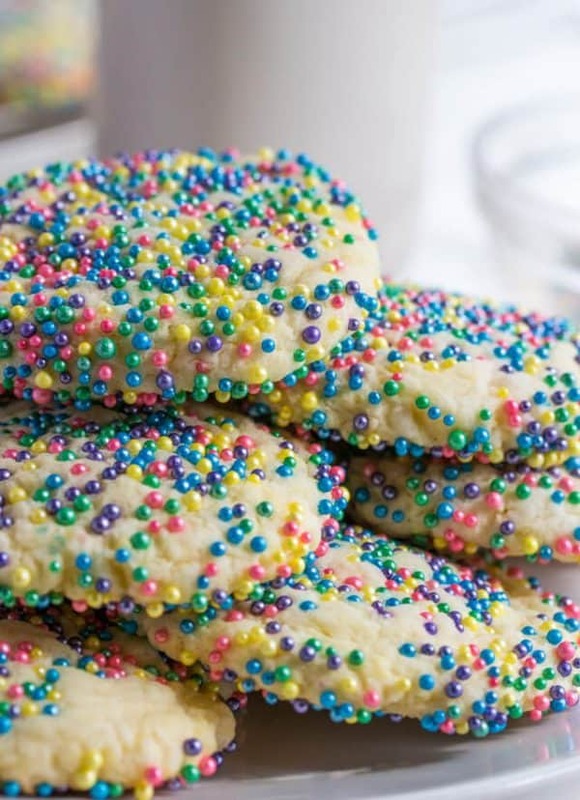 I mean I’ll eat them and I’ll tolorate them, but I mean…they’re cookies. I don’t know there is just something about bigger desserts than a round disc shaped thing that is supposed to satisfy my sweet tooth that I like more. Probably because there is more of these cakes and stuff. So I suppose if you give me a plate sized cookie, then I’ll be satisfied. 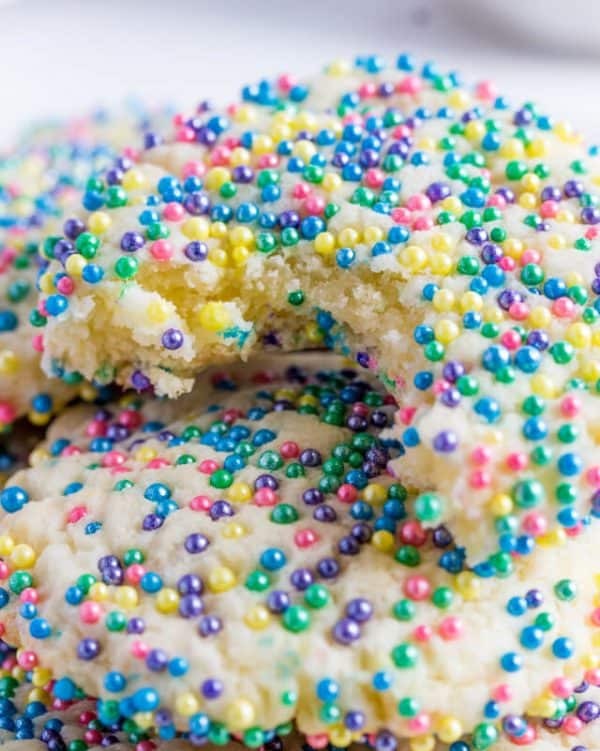 BUT these Easy Sprinkles Cookies….man they are tasty! I could actually eat my weight in these puppies. Plus, like I said, they’re simple as pie. So this could get dangerous, thank goodness I don’t keep much cake mix around my house. Funny story, I actually had to get this cake mix from my mom because I didn’t have a white cake mix in my stash. I told her that I would swap her one that I did have….which happened to be a mix that was expired, whoops sorry mom. So that shows you how often I actually use mixes. But I think I may start more often! 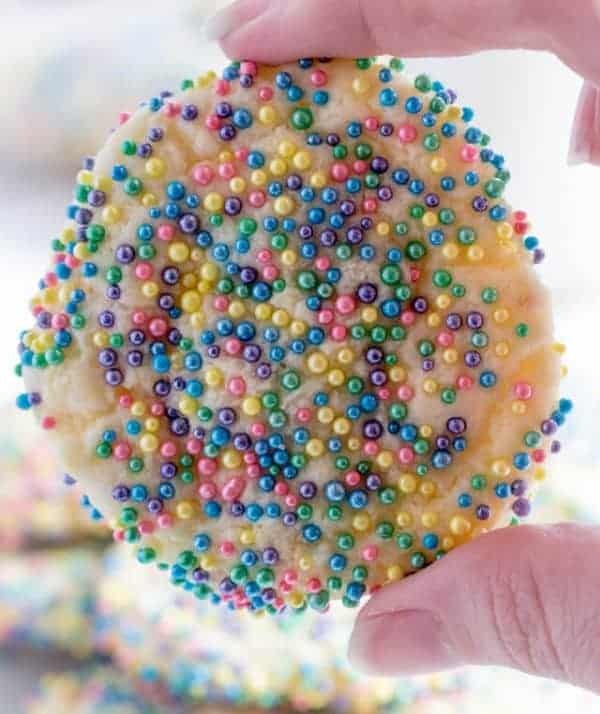 So if you want a fun Spring and Easter treat around your house that is fun for the kids, whips up in a flash and are kind of addicting then these Easy Sprinkles Cookies are they absolute way to go, on doubt! In bowl mix together cake mix, oil and eggs and stir with spoon until blended. Pour your nonpareils into a small bowl. 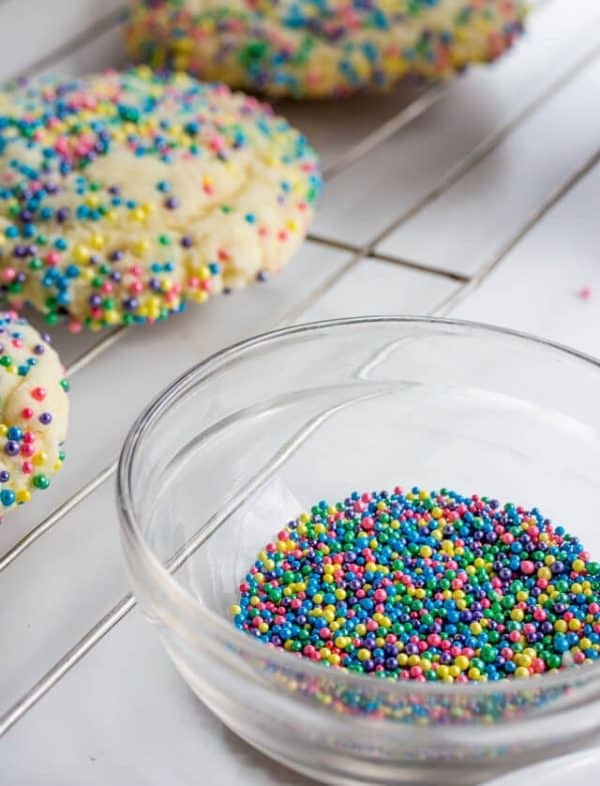 Roll your dough into about 1"-1.5" balls and roll into your sprinkles. Press down gently with the bottom of a cup to flatten, repeat with remaining dough. Bake for about 7-8 minutes then remove from oven. Let cool on baking sheet a few minutes before removing to cool on wire rack. 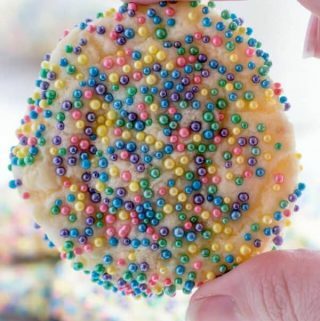 Seriously funnest 😉 cookie ever. SO pretty, too! So pretty! Love easy simple ingredients. 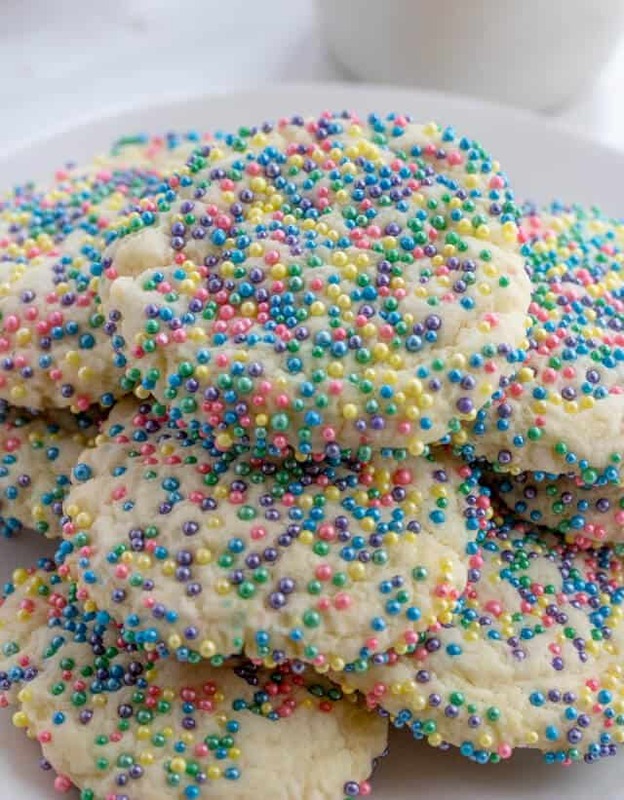 I love all of the sprinkles! They’re so pretty! Hi Gale! I found my sprinkles at Walmart in the Easter section. Essentially you can use any sprinkles but these are where I found these specific ones.